When using tempo to analyse plays in a game we need to look at how the play changes the state of the game, as opposed to the theoretical numbers we used previously. 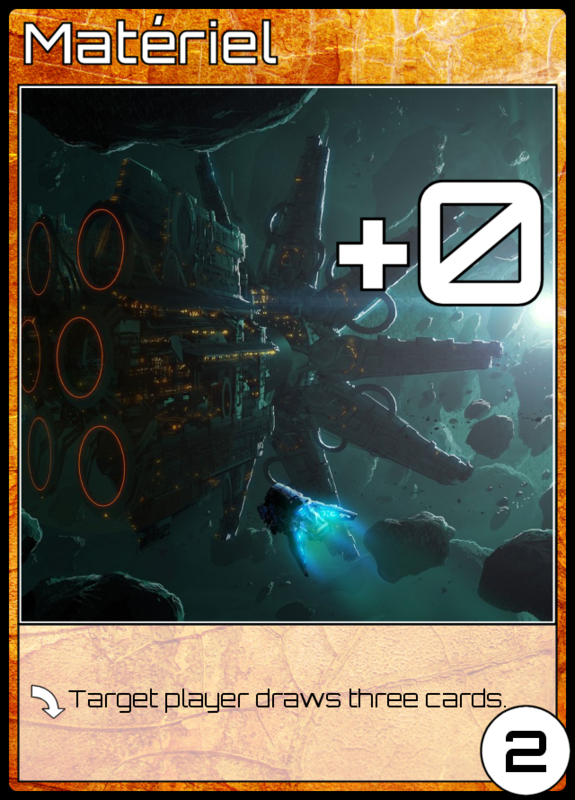 For example, if you were to make a play that would destroy an opponent's card, we no longer consider this card destruction worth a flat 2 tempo (your opponent loses a draw and a play); instead we need to look at the card we are going to destroy. Let's say you play a Laser Salvo (1ER, +0, played: destroy target card). If you destroy an opponent's Charge (0ER, +1, [starting deck is made of these]), what have they lost? They have lost 1 Energy. Ignore that they had to draw and play the Charge; that is irrelevant. The direct change to the state of the game is that they now have 1 less Energy than they did before. You might think that your play was therefor worth 1 tempo, and it would be, except that them losing 1 Energy is not the only change in the state of the game: you now have 1 less card in hand than you did before. Therefor, your play was worth 0 tempo: you have set them back by a point (of Energy) at the expense of a point of your own (a card in hand; a draw). A Number Line: useful for infants and game theorists. At the start of the game the tempo peg is at 0. You go first and draw a card: the peg moves up to 1. Your opponent does likewise: the peg moves back to 0*. You play Charge and the peg stays put: you gained an Energy, but lost a card from hand (Charges are not good cards!). Your opponent draws again and the peg moves down to -1. You draw and it goes back up to 0. Let's fast-forward a few turns! The peg is at 0 (you just drew), and your opponent plays Materiel (2ER, +0, played: target player draws three cards) targetting themselves. This is worth 2 tempo: they draw three cards, gaining 3 tempo, but lose one because they played a card from their hand: the peg moves left two slots to -2. You are now losing! Of course, maximising tempo gain isn't the be-all-and-end-all of playing Progenitor: if it was then the game would be extremely boring. Lots of other considerations must be factored in to your decision making; with two questions held above all others: "Can I win the game?" and "Can my opponent win the game and how do I stop them?". It doesn't matter how much tempo you lose doing it, making a play that wins you the game is the best play you can make. Having said that, analysing tempo is an extremely useful tool when deciding what play to make in most circumstances throughout the game. Let's examine the scenario I wrote about in the previous post: bouncing your own Laser Salvo with an Ion Charge and playing it again. Using what we've learned in this post, it's obvious that the strength of the play depends entirely on what cards you destroy. The linking play, the Ion Charge to recall the Laser Salvo, is always worth 1 tempo: you get the Laser Salvo back (effectively a card draw), and also draw a card, but lose a card from hand. The Laser Salvo provides nothing while it is in play, and so recalling it incurs no loss of tempo. 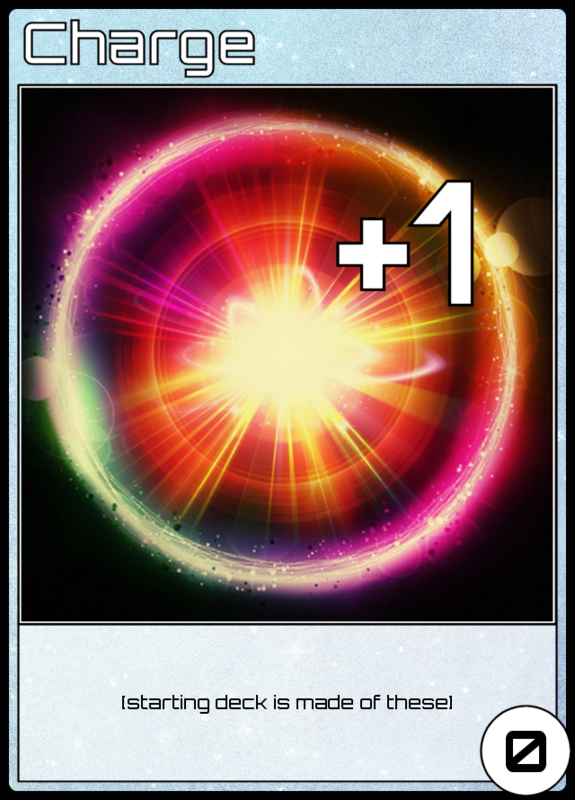 Had it +1 Energy (instead of the +0 it actually has) then recalling it would cost a tempo, resulting in the play being worth 1-1=0 tempo gained, but since it does only have +0 Energy it is a card with no worth while in play. Conversely, in your hand it can be played to generate variable amounts of tempo, depending on what you destroy with it. Thus, when asking yourself "should I Ion Charge my own Laser Salvo? ", what you need to work out is how much tempo you can generate with the Laser Salvo. Now let's say that your opponent also has an Ion Charge in their deck. They just drew three cards from the Materiel, increasing the odds that they'll have it in their hand. They won't be using it to recall your Laser Salvo (obviously! ); if they play it it'll be to recall one of their own cards. 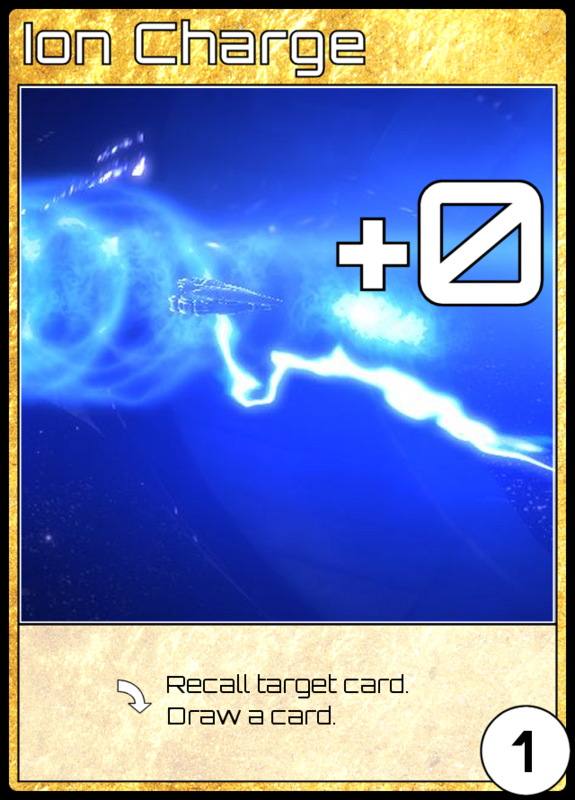 If they recall the Materiel, they are setting up a +2 tempo card draw - pretty big; Materiel is a great choice for Ion Charge. Energy Condenser, though, is not: yes, they draw a card when they play it, but instead of recalling it and playing it they could just take a Draw action to draw the same card. Bouncing it and replaying it doesn't gain them any tempo. In this situation destroying the Materiel becomes a 2 tempo play: by putting it in their discard pile before they can recall it with Ion Charge you stop them from getting to play it again. Note that you wouldn't move the tempo peg right two spaces for playing your Laser Salvo - what you are doing is stopping them moving it two left. So, destroying the Energy Condenser is worth 3 tempo, while destroying the Materiel is worth 2: which do you pick? It depends! Though the 3 tempo play is bigger numerically, other conditions might make it less advantageous. Are they about to purge, or are they trying to build up a lot of energy first? Are you racing to buy a card? Have you more cards in hand and are they looking to catch up, draw cards to get as much ammunition as you? Maybe they have another card in their deck they are trying to get to as quickly as possible? 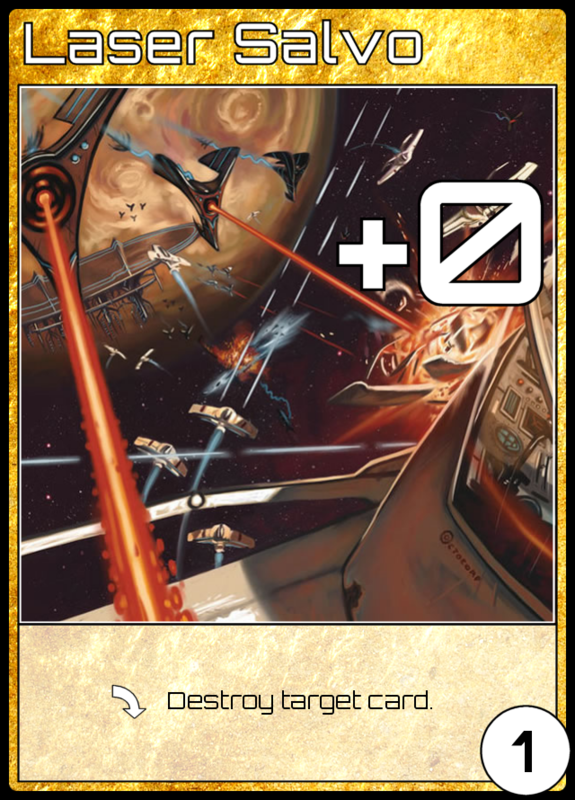 One consideration that could sway you would be that if these cards are the only notable cards in play and you destroy the Materiel then that leaves only the Energy Condenser and your Laser Salvo in play: there would no longer be any useful targets for their Ion Charge. You will have turned it into a dead draw, and a point of tempo loss for them, unless another useful recall target presents itself. * Notice that assuming you both make equal plays for the entire game, averaging the tempo score over every turn would give you a mean tempo score of 0.5, not 0. Going first is advantageous! ** The play is worth 3 tempo, but you wouldn't actually move the peg 3 spaces. When the opponent played Energy Condenser they scored the "played: draw a card" moved the peg left 1 space, and the +2 Energy moved it left a further 2, before bumping it back to the right once because they lost a card from hand. The final tempo point the Energy Condenser would make, the "purged: draw a card", would not have moved the peg: it would only move it when the opponent purged and they drew the card. 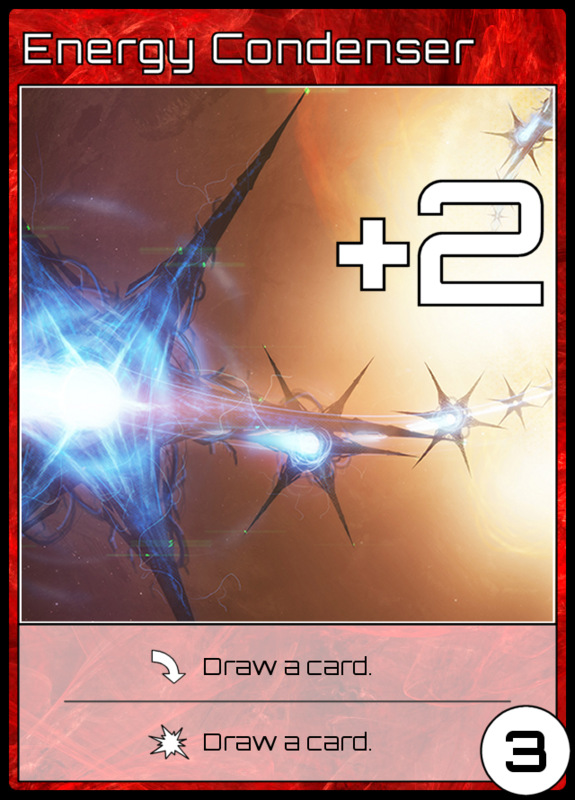 Thus, when you destroy the Energy Condenser, you move the peg right 2 spaces, for the 2 energy you just removed, and because it is gone the opponent will no longer be able to score the card draw when they purge. So you are scoring 2 tempo directly, and preventing a -1 tempo from happening.